The use of banners to promote business in St. Louis has been famously utilized in the city’s advertising landscape. Many may remember seeing large banners around the city promoting the Cardinals a few years ago. During that same time, Nestlé Purina’s headquarters used a large quality banner that turned a lot of heads in traffic. While these are major corporate success stories, any sized business can use similar products at affordable rates. 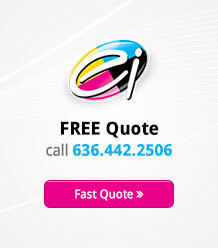 By using quality printing in St. Louis, companies can even find an upgrade in the material used. 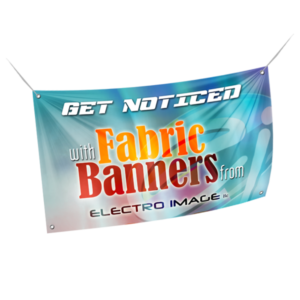 Fabric banners, in particular, bring a rich sophistication to any advertising campaign. With the ability to produce stand-out graphics, fabric banners are especially useful for indoor advertising. And if you’re printing with a budget in mind, there are numerous options to create both an appealing and cost-effective advertising product. Here’s a closer look at why fabric banners are such an attractive and comprehensive print-advertising piece. The business benefits of fabric have long been noted as advantageous. As digital printing has evolved, it has brought the ability to print quality images on fabrics without fading. With that durability, fabric banners became incredibly popular. Considering that the fabric is highly resilient, fabric banners can take considerable stretching and shaping. It’s why these banners work so well for different situations. A business can use it in various capacities without worry of misshaping the piece or causing damage. And the fabric simply looks and feels good. There isn’t any reason not to allow people to touch a banner as well as see it. By providing aesthetic value through feel and sight, the business’ branding message is enhanced. That’s especially useful at an event like a trade show. Now it’s time to see how fabric banners get used and how they convey imagery with better clarity. Businesses needing to travel regularly to trade shows will appreciate having a banner made of fabric. They store easily without getting fold marks. Because they’re also lightweight, they can easily be hung as a backdrop. With printed fabric banners, it’s worth thinking creatively, because they don’t need to be relegated to backdrop use exclusively. For example, using them as table tops is an increasingly common choice at trade shows. Applicable as a gentle drape, they can cover any type of table surface and add tangibility. Church community organizations and universities hold local events in St. Louis every day. Yet, advertising can become muddled without standout materials. A fabric banner used for indoor promotion can bring a vibrancy to important local messages. Colors look brighter than typically seen on other materials. Fabric nearly equals vinyl, which is another superior surface for printing graphics. By using enhanced color tones, the chances are better of capturing those passing by in busy interiors. Even during local events, placing these banners near an entrance or over a stage keeps an important message continually in the minds of every attendee. Strategically placing printed fabric banners near a point-of-purchase area of a retail store can help draw customers to new products, as well as inform them, to help them make an educated and quick buying decision. Thanks to the vividness of graphics, first-time visitors can assimilate clear information, including important details about what the product looks like and how it helps. Helping customers to make fast and easy buying decisions means both informing them quickly and with vivid information, and making sure that they receive that information at the right places during their journey in your store. Printed fabric banners have a wide array of customizable size options to fit your particular needs. Starting at 10′ x 3′, on down to 6′ x 3′, there’s plenty of room available to fill entire wall spaces. When showcasing a product, a larger banner over a display table or shelf allows visitors to see every nuanced detail at close range. But even smaller banners are easily seen from a considerable distance when quality printing is used. It’s always important to bring realism to promotional efforts, particularly when marketing products or services. Real photos transfer perfectly on fabric, so that the printed fabric advertising piece looks like a giant high-definition picture. As long as a business uses a digital camera to capture the initial image, there almost isn’t a photo that isn’t usable. Companies will appreciate this for presenting new items, and it’s extremely effective for showcasing people. When businesses provide social services, featuring specific individuals they’ve helped, or highlighting members of the team who have gone above and beyond, can create a powerful impact in advertising. It’s a practice that trumps using stock photography. Photos of people look close to real on fabric banners. An emotional image of those helped by a particular service or product only helps foster more immediate responses from customers. Thanks to imagery looking sharp in any lighting conditions, no one has to worry about using overhead lights to highlight features. In fact, while printed fabric banners work well for indoor advertising venues, in cases where banners must be used outside, natural elements won’t deteriorate the fabric. By choosing fabric as a base material in promoting trade shows, local events, new products, or people, these type of banners rise above ordinary marketing tools. It’s essential to think about standing out in an overly crowded St. Louis advertising market where those with the best design visions typically win the customer’s attention.